I always wanted to find a camera bag that didn't look like a typical black camera bag. A bag that didn't scream out to everyone that I'm a photographer. I travel to some pretty risky places at times so that is super important to me. When I saw the Camps Bay Backpack on ONA's website, I knew I wanted it. It was the bag that I imagined bringing on a trek in the mountains with me, working in the field in Africa, or hopping on a train in India with. Well for 2 years now I have been traveling with the ONA Camps Bay Backpack and it has truly become one of my favorites! What I love about this bag is that it fits right into it's surroundings wherever I am. The material is made out of a waxed leather canvas which makes for a pretty light bag when my gear not in it and the look of the canvas ages really well. The inside has several soft dividers that are all adjustable and removable. It holds my 15" macbook pro in a padded compartment and can fit up to a 17" laptop. I love that the top flap of the bag covers this compartment, because if i'm in a busy street market, I don't want someone to be able to just unzip a zipper and remove my laptop. The two clasps on the front allow for easy access to my camera gear when I need it really fast. The flap hides the zipper, so again, if you are in a busy area, your camera gear would be hard difficult to get it. The straps are comfortable made out of a thick air mesh padding. I've had other bags that have caused me all sorts of back problems and this bag seems to hold it's weight well. The canvas is not waterproof so I usually carry a backpack rain jacket and throw it over it when it starts to pour down hard. Although I have gotten it wet before in light rainstorms and the canvas still looks great. I get compliments on my Camps Bay all the time (many from individuals who are not even photographers) I think that speaks volumes about the bag in terms of style. Multiple times, people have stopped me in airports and asked me where I got my backpack. So here it is. I wanted to make sure you know about it! And Thanks to ONA you all have a chance to have one of your own. I've made this really simple. 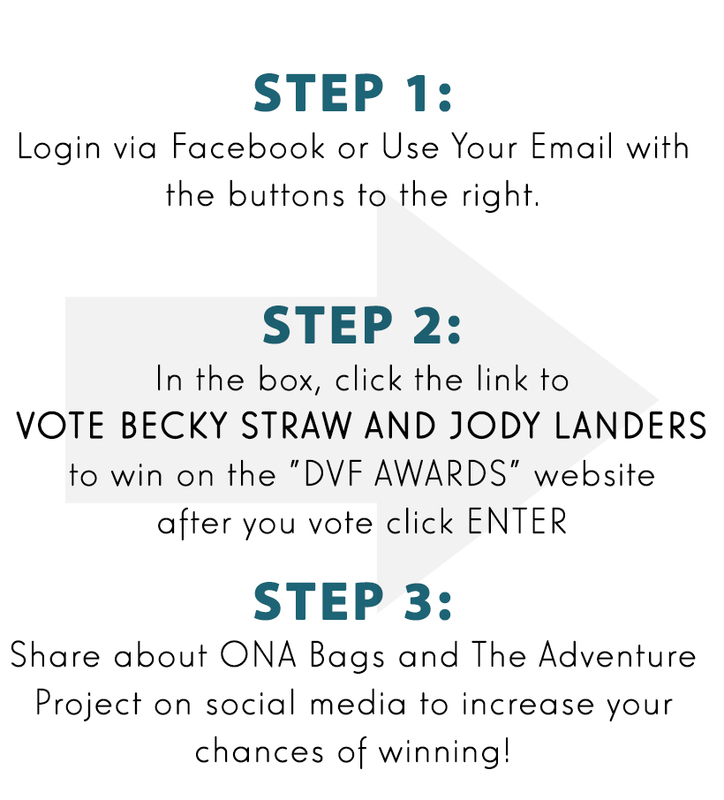 My good friends Becky Straw & Jody Landers at the The Adventure Project are nominated to win $50K in the Diane Von Furstenberg awards and All they need is our vote! The Adventure Project wants to create jobs all over the world for people. In four years, the organizations has employed 745 entrepreneurs in india, Haiti, Kenya and Uganda which include well mechanics, healthcare workers, farmers and stove masons. Together they serve over one million people each day. I've had the priveledge of photographing stories for The Adventure Project in all over those countries. I have seen first hand the impact that they've had in communities. I say this a lot and I mean it -- Every person wants a good job. If there is one thing that I truly see that brings people out of poverty, it's being employed and making a livable wage. HOW TO WIN THIS AMAZING BAG! I have a feeling she's going to take her new ONA Bag on some pretty fun adventures around the world! Tell me.......If you were to win, where would you take your ONA bag on your next Adventure?